Another weekend, another pack schedule of events. So let's get started on just a few shows coming up this weekend. 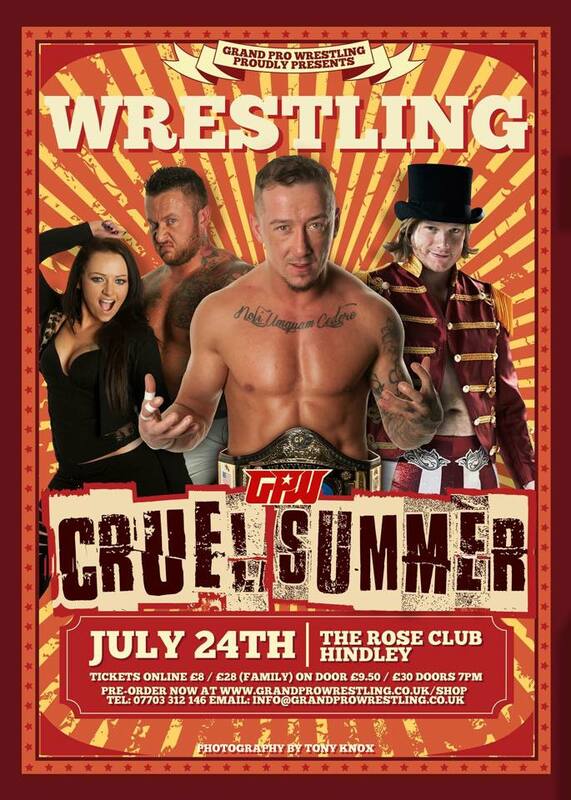 To kick off the weekend, on Friday night, Grand Pro Wrestling are in action at their regular haunt of The Rose Club in Hindley, Wigan with Cruel Summer. Right at the top of the card is Bubblegum defending the GPW Championship against Craig Kollins. 'The One Man Riot' has had a hell of a debut year in GPW, arguably the best of any in the history of the promotion. He has defeated everyone put in his path in 2015. That being said he's now facing one of the best in GPW and in Europe right now in the shape of Bubblegum. Kollins has the opportunity to become a GPW champion in less than a year but to do so he'll have to be at the top of his game to beat the man at the top of GPW. Another man who is at the top of his game is 'The Grappler' Jack Gallagher. Without question Gallagher is one of the finest if not thee finest technical, pure wrestler in Europe at present. His opponent is a young man by the name of 'The Priority' Chris Ridgeway, who has had some great matches with some of the best in Europe this year and beaten quite a few of them. Ridgeway is a star on the rise, Gallagher is a star that is burning bright. On Friday, these two stars are going to collide and it'll be explosive. The Bad Lads and the Midnight Bin Collection have had a storied rivalry over the past few months in Grand Pro Wrestling, with wins going back and for the between the two teams. It has now come to a point that their issues need to be settled and they may very well be on July 24th when The Bad Lads defend the GPW Tag Team Championship against former champions, Midnight Bin Collection in a Dumpster match. Whether their issues will be settled or not is unknown. What is known is that one team is walking out of Cruel Summer with the gold, while the other will be wheeled out with the trash. All of this plus a GPW British Championship defence, the continuation of the North West Rookie League and a lot more takes place this Friday night in Hindley, Wigan. Moving on to Saturday and we're faced the familiar dilemma of too many shows to just pick one... so we picked two! 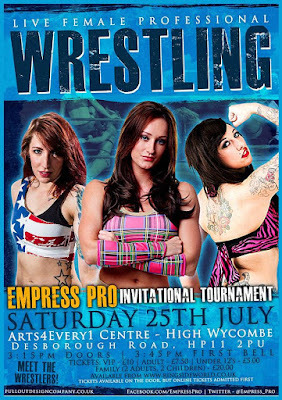 Up first on Saturday we have Empress Pro Wrestling hosting their inaugural Empress Pro Invitational Tournament in High Wycombe at the Art4Every1 Centre. The tournament consists of four qualifying matches with the the winners moving forward to a four-way final match. One of the qualifying matches scheduled to take place will see fellow Irish competitors, Katey Harvey and Rhia O'Reilly face one-on-one. Both of these wrestlers are exceptionally talented. While Rhia O'Reilly has appeared all over the UK and US and is rightly one of Ireland's best wrestling exports. Katey Harvey is probably lesser known to those in the UK. However, this match will be no walk in the park for O'Reilly. Katey Harvey is a highly-talented individual who will push Rhia O'Reilly to the maximum. Anyone unfamiliar with Harvey before the show, will be very aware of the talent and skills she possesses by the end of it, regardless of the match result. Another qualifying match taking place on Saturday will feature Kay Lee Ray and Sammi Baynz. For as gifted as both these women are, they have never face each other despite them collectively winning eight championships during their careers so far. There is a very high chance that one of these two competitors will add the EPI2015 trophy to their list of accomplishments on July 25th. Taking a step away from tournament matches, on Saturday there shall be a tag team match that will determine which pair of 'besties' are better when Nadia Sapphire & Faith Lehaine of Team Superficial take on The Bae Club's Sammii Jayne & Debbie Sharpe. 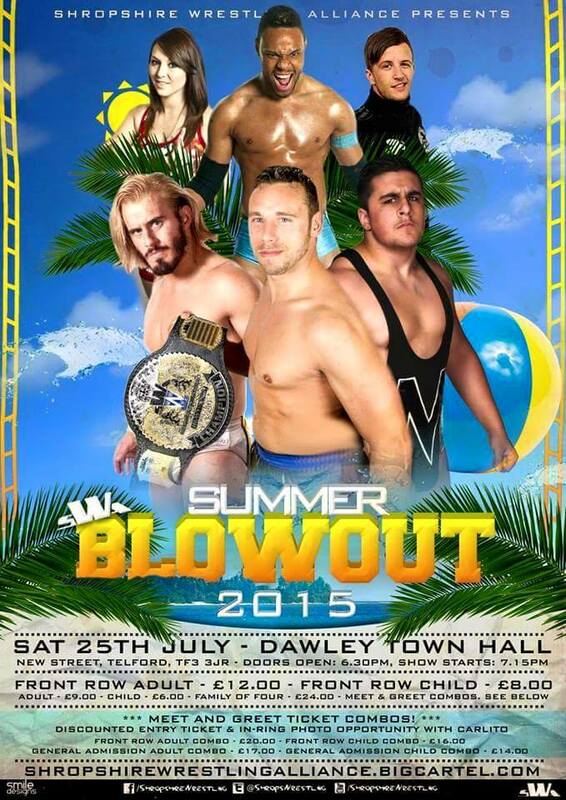 Both these teams say they are the best, on Saturday in High Wycombe, one of them is going to prove it. Add in two other qualifying matches featuring Chardonnay and Courtney plus Violet Vendetta and Addy Starr and then the four-way final, Empress Pro look set to deliver a great inaugural tournament. Also taking place on Saturday we have Shropshire Wrestling Alliance's Summer BlowOut 2015 at the Dawley Town Hall in Telford. If you're a fan of young rising talent then you'll not want to miss Chris Ridgeway vs Will Opreay. Now we've already spoke about Ridgeway earlier and how his star is on the rise right now. His opponent, Will Osrpeay is another who has limitless possibilities in their future. Both men are going further afield, picking up wins and having matches that leave people talking. On Saturday we'll see which one can pick up the win against the other. 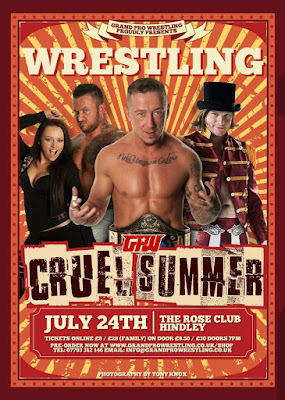 July 25th will also see former best friends become opponents when Pete Dunne competes against Ryan Smile in Dawley, Telford. This match came about when the current SWA Heavyweight champion, Joey Sanchez announced that Smile would be facing his former friend, undoubtedly as a way to stop Ryan Smile cashing-in his championship opportunity. If Smile wants to get the championship then he shall have to put his old rivalry with the 'Bitter & Twisted' Pete Dunne to rest. Speaking of championship opportunities, Chris Brookes, Damian Dunne, Eric Ryan & Dan Moloney will compete in a Tables, Ladders & Chairs match with the winner earning a championship match of their choosing. Moloney, Brookes & Dunne could all argue their right to a championship match based on previous performances. However with the added unknown of CZW regular Eric Ryan plus legalised weapons, it could well come down to who is the most resilient to decide who wins the opportunity. Add in matches featuring Mark Haskins, Nixon Newell, Chuck Cyrus & Toni Storm and SWA are on track to deliver once again. On Sunday night, Insane Championship Wrestling make their return to the O2 ABC in Glasgow for Shug's Hoose Party II, as part of their Waynestock weekend that will see them hit the Community Central Halls (also in Glasgow) the night before for Long Before Wesley Snipes. The 55 are a group of men who have run roughshot in ICW for months, attacking who they choose, when they choose. One of the men then have particularly focused on however, is Grado. The 55 have seen Grado as everything they are against and have never passed up the opportunity to show that. On Sunday night, Grado will face possibly the most dangerous man of The 55, Bram. Grado has never been one to back down from a fight and the fight will be taken to him on July 26th. It's unlikely that this will end this feud but maybe Grado can send a message and overcome The 55. Back in January, Dickie Divers won the Square Go and a guaranteed Heavyweight Championship match. The only issue with his win is that he eliminated his New Age Kliq brother, Chris Renfrew to do it. Renfrew didn't like that. From that point on, Chris Renfrew has descended into a deeper, darker place till his only focus was Dickie Divers and his destruction. Dickie Divers now stands alone in ICW and Chris Renfrew is more dangerous than he has ever been. Renfrew wants the Square Go contract but he wants to destroy Dickie Divers just as much. If Divers is to keep the contract, he'll need to not only win the ladder match this Sunday but survive Chris Renfrew. In the main event we shall see Big Damo challenge Drew Galloway for the ICW World Heavyweight Championship. Big Damo has been on a roll in ICW for months, demolishing opponent after opponent. While Drew Galloway has been defending the ICW World Championship all over the world. Big Damo feels that his isn't respect by Galloway or those in control of ICW. Galloway is undoubtly once of the most in-demand and talented wrestlers in the world. On Sunday, Big Damo is guaranteeing to prove to everyone what he already knows. 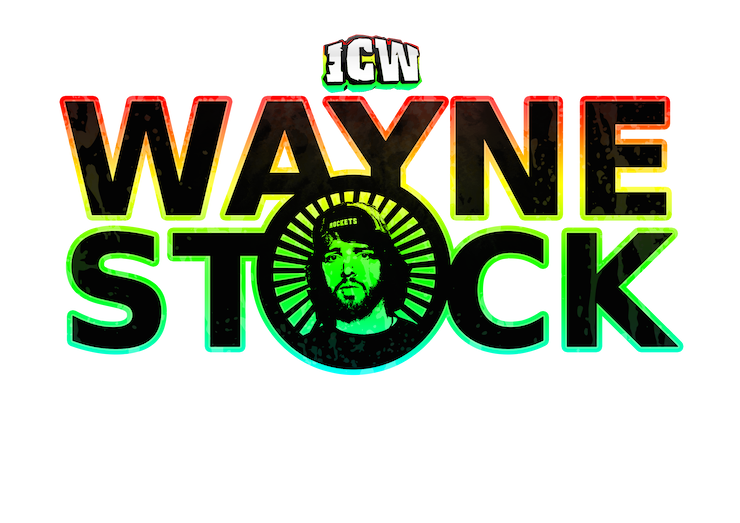 That he can be the ICW World Heavyweight champion and not Drew Galloway or ICW can stop that from happening. All of this plus matches involving Joe Coffey, Sha Samuels, Mark Coffey, Jackie Polo, Kenny Williams and not forgetting the wedding of DCT & Viper takes place in Glasgow at the old out O2 ABC.